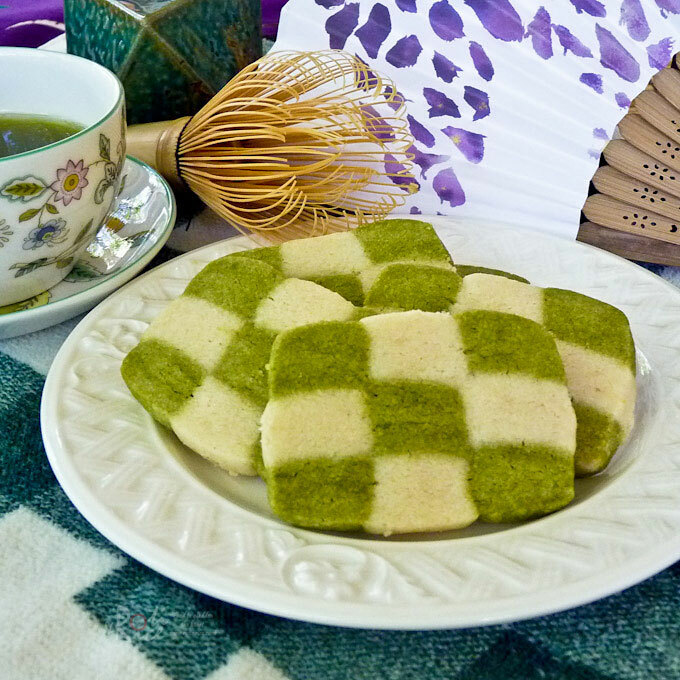 Delightful Matcha Checkerboard Cookies made with only 5 ingredients. They are easier to make than they look and totally worth the effort. For those of you who follow this blog regularly, you probably already know that tea is one of my passions. I drink tea two to three times a day and enjoy green, oolong, and black teas. When I read that Victoria at Mission: Food was having Tea Week Contest, I could not pass it up. The required ingredient is tea, of course! The contest was announced early June but I was preparing to go on my vacation then and could not come up with a dish before I left. I knew I would have very little time upon my return but I finally managed to make something today. This is my first attempt at making checkerboard cookies. Instead of flavoring half of the dough with cocoa, I decided to use matcha instead. For the dough, I used a very simple eggless sugar cookie recipe not very different from the one used in the Linzer Cookies I made for Valentine’s Day. This dough allows the flavor of the matcha to come through. The vanilla half of the dough combined really well with the matcha half. I could not be more pleased with the results. 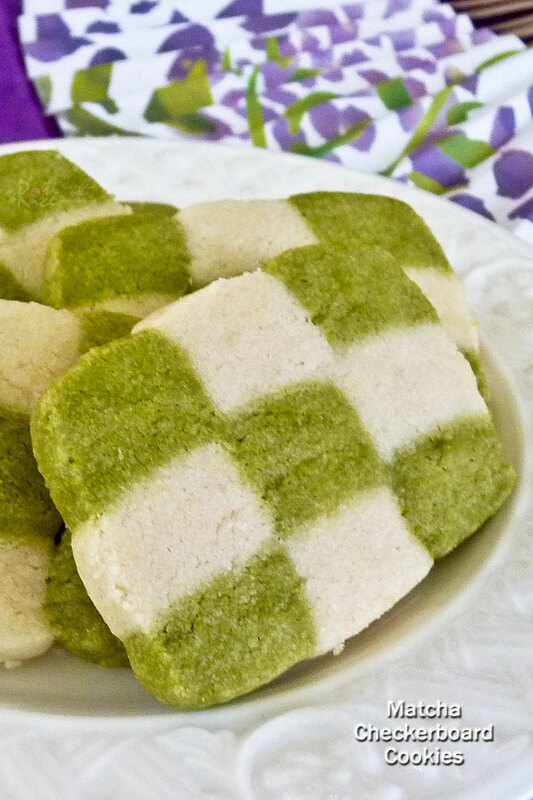 I also love the way these Matcha Checkerboard Cookies looked. They are so pretty with the cream and green colored squares. Cream butter and sugar together in a large bowl until well blended, about 2 minutes. Beat in vanilla extract. Gradually mix in flour on low speed. Turn dough onto a clean working surface. Knead dough to form a rectangle. Wrap with plastic and chill for about 30 minutes. In a medium bowl, add matcha powder to flour. Stir to mix well. Repeat steps above to form match dough. When dough is chilled, remove plastic, roll on a lightly floured surface to form two 7 inch squares. Cut each square into nine ¾ inch strips. 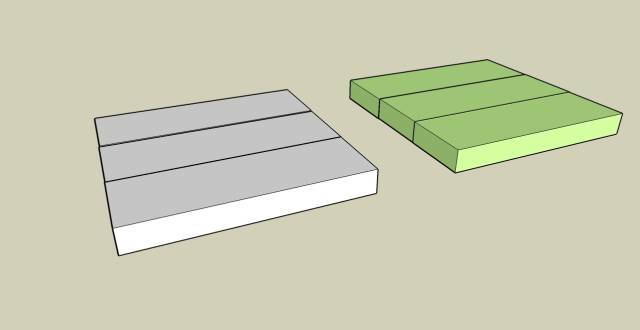 On a sheet of plastic, place three strips of dough, alternating white and matcha strips. Brush tops and in between strips with egg wash. Gently press strips together. Form second and third layers with alternating strips to create a checkerboard. Wrap with plastic and refrigerate for another 30 minutes. Repeat for second log. Cut each log into ¼ inch thick slices. Place onto non-stick baking sheet. Bake for about 12 minutes. Remove and let cookies cool for 5 minutes before transferring onto a wire rack to cool completely. 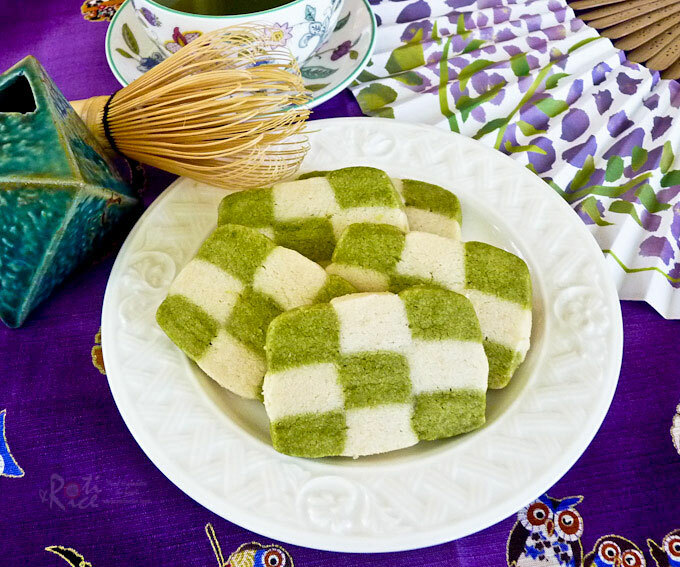 These cookies are delightful with a cup of matcha. August, a fan of Roti n Rice suggested in the comments below that I may want to try a new method of assembling the checkerboard. I finally took his suggestion by making these Chocolate and Vanilla Checkerboard Cookies. His method worked out very nicely. Please check out the step-by-step instructions or video in the post. Please click on the picture to get to the post. Welcome back! How was your vacation? These cookies are so pretty! They look delicious! These are beautiful Biren…a real work of art. Welcome back also! Thanks Jillyann! It was a little tricky at first but I am glad the way it turned out. Thanks Elin! I love the way the cookies turned out. I think the matcha goes very well with the vanilla. It is a beauty 🙂 …tea time! These cookies are beautiful Biren! You make this look so easy, but I'm sure it's not as easy as you make it look. I'm sure my daughter would find something fun with the checkered design as well. I've never had a green tea cookie bofore, something I would definitely love to try. Would I buy matcha in any Asian grocery store? And is it in powdered form. I'm quite intrigued. Thank you for sharing this Biren. OOO Biren! I LOVE these! Someday when I have more patience than I do right now, I'm totally going to make these. Love it. HI Biren, the cookies looks beautiful. Great job. I love anything with green tea! Very pretty. I should have pass you a box of Japanese green tea when you were here. I love those checkerboard patterns, and your cookies have to be good with all that butter!! I have been seeing more green tea recipes using the Matcha, I used to drink a lot of Yunnan Pu erh, have you ever tried that, it was my favorite a gorgeous red colour! Wow…that's really pretty! Can make a big piece and play game with it 😛 They must be very delicious and great with tea. Thanks Denise! Battenburg cake is a pretty cake but I have never worked with marzipan. Might be a fun project 🙂 I was a little nervous of this but very glad the way it turned out. I will definitely make these again. I love everyhting about it – color, taste, and look. Gorgeous cookies!! I have never attempted checkerboard cookies but I've often admired them. Beautiful pictures, too! I think you would have a better chance of getting it at a tea shop. The Asian grocery store that I normally go to does not carry it but the larger ones are pretty well stock and may just have it. The other option is to buy it on-line. I like green tea desserts too. The color is lovely and they taste so good. Thanks Ann, the thought is much appreciated. Yes, I do enjoy Pu erh and currently have a very nice brick with me. It is especially good with foods that are a little more oily. Lovely creation. Amazing cookies that may be too pretty to eat….but I would. Elegant and inspired! I have a can of matcha in my fridge that definitely needs to be taken out to make these wonderful cookies. I love this idea–and love making sweet treats with matcha, too. What a beautiful job! I LOVE these cookies! Smart choice of using matcha. Good luck with the challenge! It is like a green tea Alice in Wonderland cookie! 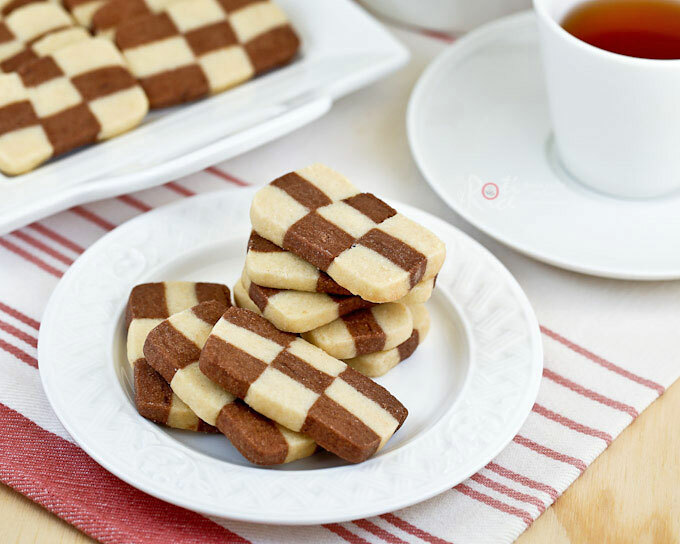 Dear Biren – What a touch of whimsy with these delightful checkerboard pattered cookies. Love them! But I do love it. Hey Biren, this is beautiful. I already saw it somewhere else, but I didn't realize it was your photo. I need to read the instructions more carefully, as I'm bewildered as to how you assembled the dough…gonna look at it now. Hope your'e doing well after your trip. I'm always more tired after vacation than rested (smile). These cookies are so pretty…I've never made cookies like that. I'm very interested in trying them to go with my coffee and tea. Nicely done, Biren. Hi Biren, These cookies are lovely and would be beautiful served with tea in the afternoon, very creative and delicious looking, congratulations on coming up with such a clever idea! These cookies are adorable and look so impressive! Bravo! They came out beautifully. The green color is so unique it's magical. This has been into my list-to-do for quite a long time. Have yet tried it! Hopefully, next mission! haha… Thanks alot! This looks so delicious, I love the green colour. Beautiful presentation, Bravo!! These are a lot of work! It’s probably even worse because I tried to make them gluten free. They are nice but very crumbly. Gluten free cookies tend to be more crumbly. I would suggest sticking to the original recipe using all-purpose flour. Indeed! If it was up to me, that’s exactly what I would have done but one of my friends has gluten issues. On observation that I’ll make, inspired by having watched my grandmother cutting fabric when she was making quilts, is that assembly can be done more effectively. You might find the alternate method of assembly I am suggesting more to your liking because it uses fewer cuts (8 instead of 16) and because you are always handling bigger pieces (the pieces are always three checkerboard widths wide). When you create the two squares of cookie dough you should slice them into three pieces rather than nine. 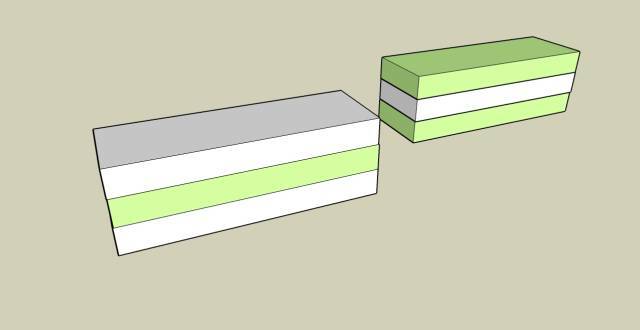 The three pieces of white and green cookie dough should then be reassembled into two alternating stacks (you might want to use egg wash to help glue the layers). 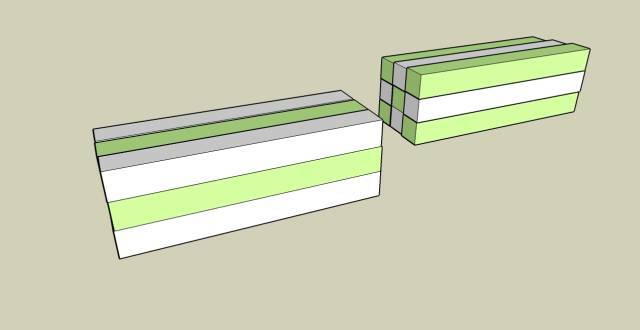 The two stacks are then trisected and reassembled into two checkerboard blocks (Again, you might want to use egg wash to help glue the layers). Trying it with real flour I still found the dough very difficult to handle (I probably used too much flour). Another observation would be that if you happen to own a wire cheese cutter board you might find it to be the best tool to slice off these cookies. I did.